Eager eyes and small hands scroll through buckets filled with bright, colorful books. Suddenly, hands and eyes stop to focus on the perfect book. It’s a scene that brings joy into the heart of Polly Wilson, Crockett Elementary first grade teacher. 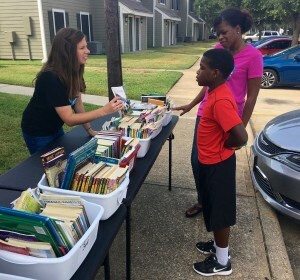 Thankfully, it’s a scene she experiences over and over again at Bookmobile, a Crockett Elementary mobile library held every Wednesday from June 22 to July 27 at the Saddlewood Apartments and Timberlake Mobile Home Park in Bryan. HELPING HAND – Megan Paterson, second grade teacher from Crockett Elementary, helps Isaiah Nutall, fifth grade student from Branch Elementary, find a book. This morning’s Bookmobile event was the last event of the summer. The books that weren’t checked out by children today were packed away to be used in school classrooms and to be given out to children next summer. Wilson is entering her 35th year as a teacher, but come June 2017, you can count on her, and a team of volunteer employees from Crockett and other Bryan ISD schools to set up makeshift mobile library stations all over again. Throughout her career, Wilson understood the importance of reading. She observed that children who read over the summer excelled at a faster pace than students who didn’t read at all before school starts. Wilson later realized there is a valid reason many students don’t read at home in the summer. Wilson took the idea of a mobile library to Debra Ehrhardt, principal of Crockett Elementary, who thought it was a great project. Together, they worked with Assistant Principal Katrina Horace and fellow Crockett teacher Helen Russell to gather enough funds to get Bookmobile rolling in June 2014. Parents, students and educators realized the value in the project right away. The initial success inspired Wilson to write three grants to keep the project going. Bookmobile is currently funded by the Bryan ISD Education Foundation, the Bryan Rotary Club and the Texas Retired Teachers Association. The grant money has helped sustain the project, which Wilson said has grown every year, but it has not made the process of finding reasonably-priced used books any easier. The hard work has paid off, as Wilson said it’s obvious that Bookmobile is successful because you can see the results in the employees that choose to volunteer during their summer vacation and on the faces of parents and students. Many of the Bryan ISD teachers and administrators that volunteer at Bookmobile realize the success of the event immediately. Megan Paterson, a second grade teacher at Crockett, said that two students at last week’s event didn’t even wait to get back into their home before opening up their books. 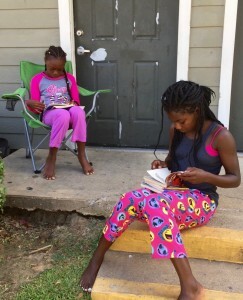 FAST READERS – Two eager Crockett students open their new books right away and start to read on their front porch. The result of keeping children engaged in summer reading and preventing the “summer slide,” as Wilson call it, pays off in multiple subjects during the school year. Cristal Gallegos, a fourth grade math and science teacher at Crockett, volunteered for Bookmobile because she understood that reading impacts the subjects she teaches. Wilson said that if a child wants a book, “we’re not going to turn them away.” For this reason, the program is not limited to Crockett Elementary. Families from other Bryan Schools and even other school districts can participate in the book exchange. 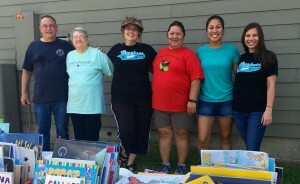 WORKING TOGETHER – Bookmobile volunteers pause for a photo op. From left: Gary Blazek, Nancy Wiese, Polly Wilson, Mary Rosas, Cristal Gallegos and Megan Paterson. Like an actual library, volunteers write down the name of the books that are checked out and the parent or child who checked them out. Once the children are done reading the books, they can bring them back the following week to get another set of books. Wilson said the children are on an honor system, and the volunteers stated they have had “great success” in getting the books back. Also, children can select a few titles from the donated book boxes to keep. Wilson said today was a “slow day” compared to past Bookmobile events, but won’t keep her and the rest of the Bookmobile team down. “If we can get books in one kid’s hands, we’ve done our job,” Wilson said. If you want to donate books to Crockett Elementary’s Bookmobile mobile library, contact Polly Wilson at polly.wilson@bryanisd.org.